Here are some photos of our town and the area surrounding it. Our lovely little rental house is an endangered species, a ranch, all on one floor. Excellent for my problematic knees and ankles. It would have made more sense to build the deck on this side, where there's a lot more space and still plenty of privacy. Instead, the deck is in the back, up against a neighbour's house -- which I'm guessing was built after ours. But these neighbours are rarely home, they are usually off exploring in their gigantic RV. And we are very happy to have a deck! Our street -- looking towards the cul-de-sac, the forest. Our street looking towards the main road. Note the mountains in the distance. Here's the view from around the corner, on an (extremely rare) clear day. Less than a five-minutes drive, we are in town. Here's my library! Downstairs from the Library is the Port Hardy Museum. They've been closed for the winter, but I'm looking forward to working with them. The Library and Museum are on Market Street, Port Hardy's cute little main street. Guido's is a local landmark -- an excellent cafe, a lovely small bookstore and gift shop, and a large and extensive shop filled with the work of local artists and artisans. It's the only place like it in our town, and it's an absolute gem. This restaurant has two names -- the original name, Captain Hardy's -- which most people still use, even though it's no long the name of the place -- and the new name, Fire Chefs. Captain Hardy's had a long history here, and the new owners very smartly kept one of the signs. The food is amazing. I keep trying to order something different, but when you've found the most perfect fish-and-chips -- from halibut, no less -- it's hard to say no. There are lots of murals in the area. The one above is next to Fire Chefs. The one below is the library and museum building. Like Guido's, Macandale's is a local landmark. Unfortunately a lot of Port Hardy looks like this. This is what it means to live in a "resource town," tied to extraction industries. A mill closes, a mine is abandoned, a fishing run is depleted -- and this happens. It's boom or bust. But facing the other way, you see this. You're never far from mountains and water here. The Christian Fellowship offers a free, hot -- and reportedly delicious -- breakfast every morning. They serve anywhere from 30 to 150 people each day. They are good people, who treat everyone with dignity and respect, and aren't fishing for converts. Here's our little post office. There's no door-to-door delivery here. That's no problem for us, as we live five minutes away, but it's definitely an issue for more rural folks. The post-office workers are super friendly and helpful. That's Allan and Diego going to pick up one of our many packages. It's Sunday -- on weekdays there are always lots of trucks outside and people running in and out. The sign says mall, but it's really it's just the Save On Foods (supermarket), a pharmacy, a subway, and a lot of empty space. There's also a job bank and some other service agencies inside. There are a few chain stores here. This is the intersection at Rt. 19 -- the road down to Campbell River and the rest of the island. You can see our only fast-food restaurant, and our two gas stations. This guy is everywhere. There are no traffic lights in the whole town! This intersection is known as "the four-way". See the bay and mountains in the distance. This is a First Nations-owned hotel and restaurant. The food is supposed to be great; we are looking forward to going. I'm planning a separate post about the restaurants of the area, but I'm waiting until we've been to them all once. The options are limited, but so far all the food has been really good. We heard there was Chinese food in town, but we couldn't find it. Along with several other things I was looking for, I was told, "It's at the old mall". We looked everywhere but still nothing. Finally I asked someone where this "old mall" is. Turns out it's between our place and the main street, but well off the road. It's more properly called a ghost mall, although it is trying to make a comeback. The Old Mall is on a hill; this is the view from the parking lot. Of course there's a mural. This is the Chinese restaurant. There is supposed to be a Filipino grocery store in the mall, but I never found it. There is a nails/beauty place, a couple of kiosks, and not much else. But there was a lot of construction. I'll check back on their progress. I was very surprised to see a lovely little cafe in the middle of the ghost mall. On Rt. 19, as you enter the Port Hardy District, you pass a group of these historical plaques. They are really nicely done. Eventually we will visit everything listed here. Five of these communities are home to my libraries. Alert Bay, a First Nations community, also has its own library. Don't you love tourism history? Those "hardy Scandanavian immigrants"
were striking coal miners! They left out the best part! Some other random facts about the area. 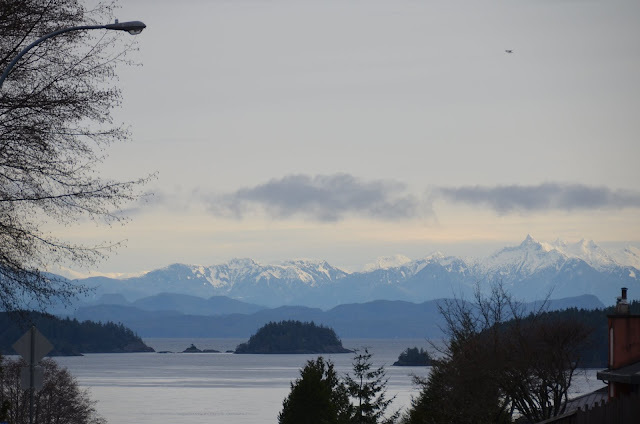 Back in town again: the bay is steps away from Port Hardy's main street. Every time we're there we see at least one bald eagle. Every town in Canada has a cenotaph, but this one also honours First Nations people who died in the empire's wars. Here are some views of the bay south of town, and also Storey's Beach, a great place to picnic or take your dog for a run. On the way back from Storey's Beach, we turned off at a sign for wildlife viewing. It was an estuary, said to be excellent environments to see migrating birds -- and animals looking for a migrating-bird dinner. We didn't see either, but it was a lovely walk. Pretty nice spot to wait for a ferry. This boat goes to Bella Coola, Haida Gwaii, and Prince Rupert, on BC's Inside Passage. There are huge mountains in the distance, but they usually look like this. I'll do separate photo posts for each of the towns or sites we visit.